The Netherlands has now the first intercontinental analogue repeater. For nationwide coverage the repeater PI2NOS uses 17 receivers, all on 430.125 MHz (one in Belgium) and 3 transmitters on the same frequency namely 431.725 MHz using the so-called co-channel technique. But now PI2NOS went overseas to the island of Curacao in Caribean Sea, a distance of about 7842 kilometers or 4873 miles between Amsterdam and Curacao. 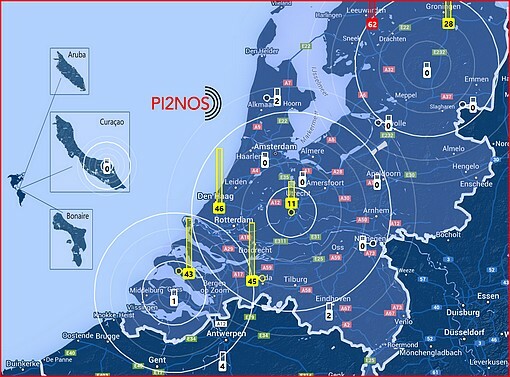 The repeater operates there under the callsign PJ2NOS and is via the Internet attached to PI2NOS in the Netherlands. The internet connection is fast enough so that radio amateurs on Curacao easily can log in to the Dutch repeater.